. Double head automatic B.O.P.P. 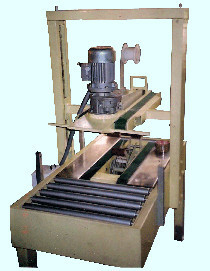 Taping machines are suitable for Taping on top & bottom of cartons.
. Taping machine capacity is 10 cartons per min depending on carton length.
. Carton height from permissible 150 mm to 500 mm.
. Carton width permissible from 150 mm to 450 mm.
. Machine can be supplied with automatic flap closers for three flaps of cartons.
. Machine can be adjusted for carton height and width in one minute.